CHITWAN, April 15: The construction of Mugling's new bridge over the Trishuli River that connects Chitwan and Tanahun districts is in the final stage of completion. Officials of the Department of Roads (DoR) and the contractor company have confirmed that the arch bridge which is being constructed alongside the old bridge, is now few weeks away from completion. Chief of the Bridge Division of the DoR Dipak Bhattarai told Republica that the construction works of the bridge in nearly complete. “The bridge is almost ready,” he said, adding, “Only a few works are left now.” He claimed that efforts are being made to complete the bridge within a month. “We will also conduct an examination of the bridge before opening it,” he said. 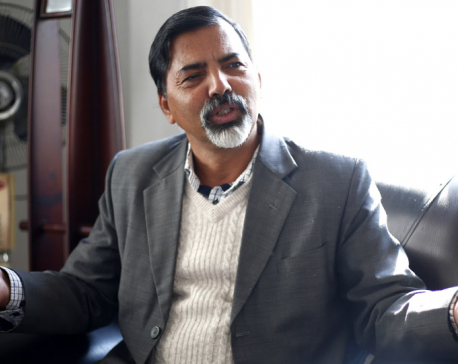 Bhattarai claimed that the bridge is the second arch bridge of Nepal designed by Nepali engineers and is being constructed by Nepali contractor. Another arch bridge recently came into operation at Bijulibazar of Kathmandu. Elite Adventure and Lohani JV have been undertaking the construction of the bridge since 2014. It is being built with a budget of Rs 120 million. According to the Senior Supervisor of Elite Adventure, Motilal Sharma, 96 percent of the construction has been completed as of now. He said that small works such building the railing of the bridge are left. “The bridge will be completed within a month,” he said.